Recently I featured a fabulous new business mum on the blog, Rachel from Little Grippers who asked me to try out her brand new product and give you my thoughts. 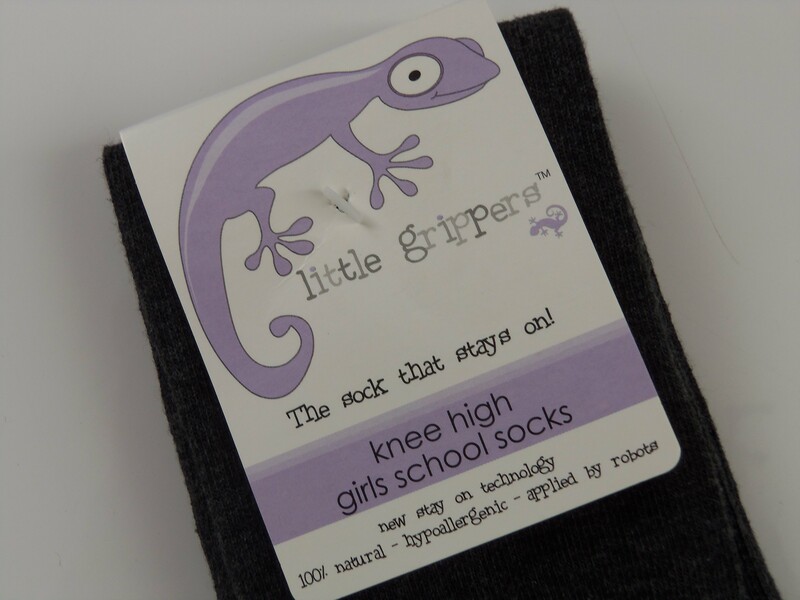 Little Grippers is a brand new British company producing a small selection of socks with a difference. Ever got fed up telling your children to pull up their socks? School socks always falling down?? (This is a common problem in our house!) Well if it’s the case for you then Little Grippers tells us they have the answer. They have developed what they call, ‘stay on technology’, a performance enhancing, natural adhesive silicone applied to the products by robots. Apparently it sticks to the skin rather than grip it, leaving no residue and making movement and stretching easy and comfortable. It is hypoallergenic, 100% breathable and dermatologist approved providing no skin irritation at all. Sounds rather amazing doesn’t it? We tried 2 pairs of knee high girls socks, one in age 3-6 and the other in 7-10. My girls fall into the middle or end of each of these age brackets so they would be a good fit. The girls were intrigued by the stickiness at the top of the sock, not having tried anything like this before but were happy to give it a go. The first thing we noticed was that the socks were on the large side with plenty of excess in the length. We often find this with socks and after a wash and tumble or two we usually find the fit much better. The material felt lovely and soft and they looked great on the girls. So, did they stay up? Well yes they really did, for the whole day. No problems at all on that front. There were a few marks left on their legs from the grip of the socks but then you’d get that with any new socks anyway and it didn’t bother them. Definitely a hit and well worth the £4 price per pair. I know you can buy a set for not much more than this at the supermarket but they do fall down after a few washes and annoy the children, so I’d definitely recommend Little Grippers. Well worth a try! At the moment they stock school socks, including over the knee for older girls and baby socks, all with their stay on technology, but are in the process of developing a range of mittens and gloves too. These will be a huge hit with mums everywhere I’m sure. How often have we lost a baby mitten?? Or how much do babies pull their own mittens off? I really do think they’re onto a winner with these. You can see more about the company and products at littlegrippers.co.uk and we wish them loads of luck getting their products out there to the masses. Disclosure: Little Grippers kindly gave me 2 pairs of socks for the purposes of this review. The opinions expressed however are genuine and honest. Wow. It’s a good brand in British. I love their products. These socks make my feet itch. I don’t like it.